“You never forget the Bracero experience,” former bracero Aurelio Marin commented, perfectly summarizing the triumphs, tribulations, and turbulence of America’s highly-controversial and highly-impactful Mexican Farm Labor Program Program, commonly known as the Bracero Program, which started in 1942 to supply able-bodied Mexican laborers to U.S. industries suffering shortages at the outset of World War II. In exchange for their labor, the workers received temporary legal residence for the duration of their contract. Braceros worked in almost every region of the United States, finding themselves employed in everything from railroad construction and industrial maintenance to agriculture, the largest area of employment. 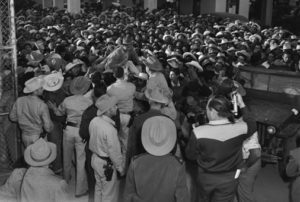 Of the 4.5 million braceros admitted, California received the largest number of men with Texas ranking a close close second. For Americans, the program offered a critical source of support for the wartime economy; for Mexicans, particularly young men, it presented the opportunity to come to the United States for employment and send money home to their families in Mexico. Houstonian Victor Escalante remembers what a boost it was for his family every time his father sent money home, “We were poor, and in those days there was a lot of money… [for] ordinary expenses.” On the surface, the program appeared to reap rewards for the United States and Mexico, but these gains were made off the backs of men who labored tirelessly for a better life. 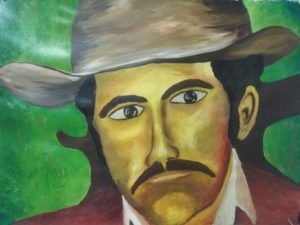 Phil Ochs, an American protest singer and songwriter, released this song in 1966, two years after the Bracero Program ended. With sarcasm and meaningful lyrics, he described the harsh conditions of the program. He particularly critiqued braceros’ wages, living conditions, and dangerous work conditions. This small segment of a Spanish documentary, Programa Bracero Triste Recuerdo (The Bracero Program, a Sad Memory), includes interviews with braceros sharing their Alien Laborer’s Identification Card. This expert from Harvey Richard’s documentary film, Factory Farms, features rarely seen videos of braceros arriving at the reception centers at the border, the humiliating cleaning process, and the journey to their fields.